Casanova of the Woods is located in the heart of the Val d'Orcia, UNESCO World Heritage Site. The farm of the end '700 has preserved the original stone structure and enjoys a panoramic position towards Monticchiello and Pienza. The beautiful Montepulciano is just 4 km. Will be like going back in time: the house is nestled in the woods, an ideal place for a relaxing holiday. But also of culture due to the proximity of centers famous all over the world: Montalcino, Cortona, Bath Vignoni, Rapolano, San Casciano. A place full of charm and history that you will bring in your memories forever. A Casanova of the Woods, guests can take advantage of 3 large double bedrooms, one twin bedroom, three bathrooms, three living rooms, three fireplaces, an old oven interior and spacious grounds with orchard and olive grove. The farm is equipped with satellite TV and a full kitchen with every appliance necessary. We recently rented this lovely house in Tuscany. While there were only four of us, there was room for 8. The house had beautiful areas for relaxation and met our needs perfectly. Unfortunately we had rain for several days of our stay and didn't get to enjoy the outside patios and seating areas, but they certainly were inviting. Filippo, the owner, was most gracious and answered my many questions as I prepared to book this property. Would love to stay there again! Our group of 6 people ( 3 couples ) spent three nights at the farmhouse. As described in VRBO it was truly a magnificent home built in 1700. it was also in a great location to drive to surrounding villages, as we did during the day, We would spend the evening preparing dinner and building a fire in the fireplace. I would highly recommend staying here. Comfortable house in a perfect location! We spent six nights here and enjoyed our stay very much. The house has three bedrooms with private bathrooms and is ideal for three couples, where one unit also has an additional smaller room tfor two children. The house and surrounding area are beautiful and spacious and the kitchen is fully equiped. 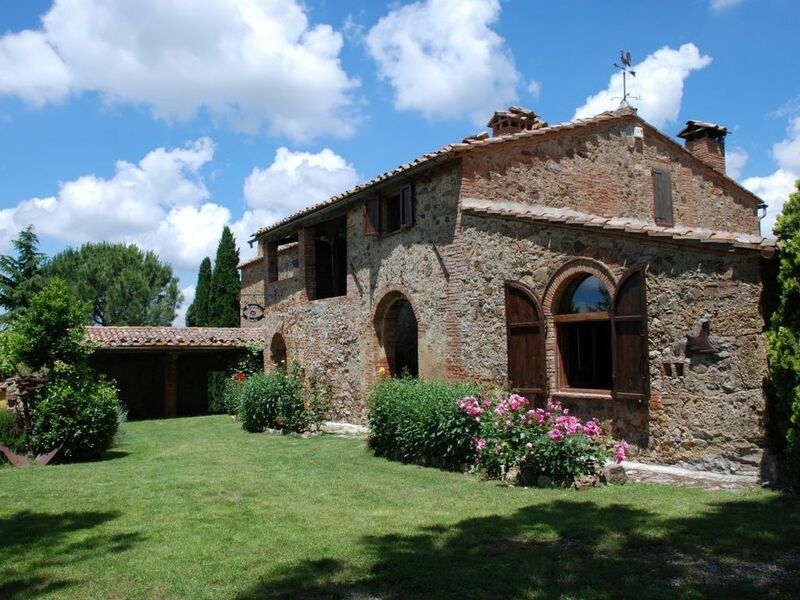 The location of the house is great for people with cars, since it is less than 10 minutes drive to Montepulciano. We had an electricity and water problems but they were solved 20-30 minutes after we texted the owner. The only thing we disliked was paying more than 60 Euros for electricity for six days - the weather was perfect so we did not heat/cool the house or used the kitchen extensively, so this payment seems to be only for hot water (which we did have all the time). We highly recommend this place and we enjoyed staying here very much! Assaf stayed with us during his trip to Montepulciano. He was very nice, respectful and easy to communicate with from beginning to end. Our place was left in great condition, will definitely recommend Assaf to any host and look forward to having him back in Montepulciano and our place soon! We had a great stay at this property. The villa was beautiful, clean and met all of our expectations. It is close to Montepulciano but down a long private road in the surrounding hills. Sehr geräumiges Haus in großartiger Lage. Sehr schönes Grundstück. Sauberkeit ziemlich gut. Ein insgesamt beeindruckendes Haus, das fast schon zu groß ist, so dass gar nicht alle Räume genutzt werden können. Mit vielen antiquarischen Objekten ausgestattet, due aber zugleich auch als Staubfänger wirken. Überhaupt hatten wir - vielleicht weil die Saison erst anfing - den Eindruck, dass ruhig etwas besser abgestaubt und gewischt hätte werden können. Der Garten ist hingegen sehr akkurat gepflegt und bei warmem Wetter (das wir leider nicht hatten) ist es auf dem Grundstück sicher wunderschön. Sollte man heizen müssen, ist mit beachtlichen Mehrkosten zu rechnen. Der Verwalter, Herr Franco, war sehr zuvorkommend. The house is located in the heart of the Val d'Orcia, UNESCO World Heritage Site. Just 4 km from the magnificent Montepulciano and 20 minutes from Pienza, jewel of architecture. Not far from Siena, the thermal areas of Bagno Vignoni and Bagni San Filippo. The water of Chianciano, good wine of Montalcino, the story of San Quirico, Radicofani, closed and dozens of other magical places are just a few kilometers away. Ancient stone farmhouse can enjoy the view of the sunset over Pienza and Monticchiello, the taste of the campaign, the spectacle of the olive trees and vines among the most famous in the world. Il prezzo include la biancheria e le pulizie finali. Non incluso il costo dell'elettricità che sarà quotata 0.30 centesimi/kwh The cost for final cleaning and linen is included. Linen (sheet, towels) is changed once a week. Price include also heating/air conditioning, hot water, gas and taxes. Electricity consumption is at your expense and will be charged separately (0,30 cents/kwh). Le coût pour le menage finale e pour la location des draps, si demandès, elle est comprise dans le prix (le linge est changé une fois par semaine), à l'exception de l'électricité à votre charge (0,30 cents/kwh).